Home » Recent Posts » The Best Paleo Chocolate Cake. Ever. The Best Paleo Chocolate Cake. Ever. 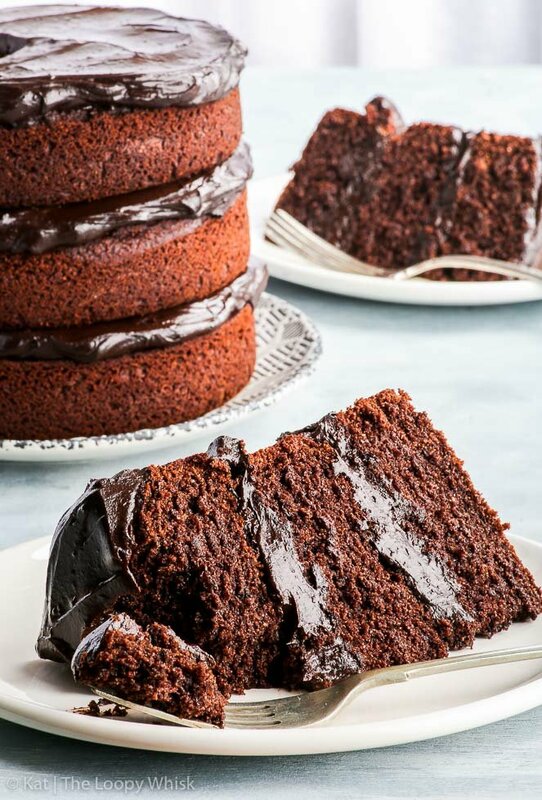 Prepare to be blown away – by this healthy paleo chocolate cake. It’s decadent, it’s chocolatey and I bet you can’t tell it’s also gluten, dairy and refined sugar free! Super easy and quick to make, it’s the perfect mid-week chocolatey treat. And even better – no nuts, for all those who are fed up with all the healthy sweet treats being nut-based (or have a nut allergy)! The best. That’s a bit presumptuous, isn’t it? 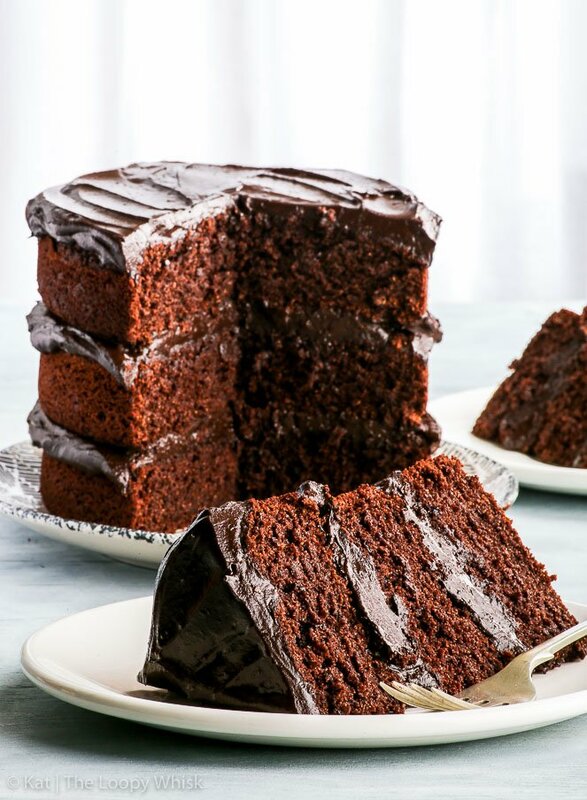 It’s assuming that you’ve tasted all the paleo chocolate cakes out there and that THIS ONE comes out on top. Unfortunately, I haven’t sampled all the paleo chocolate cake recipes in existence – but I’m still confident in my claim. Because people not following the paleo diet (or any sort of diet) couldn’t tell whether this cake is healthy/paleo/gluten/dairy/refined sugar free on not. And, yes, it’s HEALTHY, paleo and allergy friendly (and that includes any nut allergies). Basically, you could eat if for breakfast, and it would be a really balanced choice. Plus, that’s one hell of a reason to get up on a dreary Monday morning! Or any morning, really. Simple ingredients, that you most probably already have in your pantry. The coconut oil, the liquid sweetener of choice and the cocoa powder come together to make what is essentially (slightly thick) melted chocolate. It’s just as luscious, just as shiny and just as dangerous. Next, eggs are mixed in and the lusciousness factor increases. Exponentially. After we’ve added the almond milk, we basically get a bowl of what looks like hot chocolate. Life is good, my friends. Life is good. The dry ingredients are chucked in (<— totally professional vocabulary, don’t you know) and we’ll mix everything together until we get a really dense mixture that just seems… wrong. Because – it’s chocolate cake. The batter should be runny and smooth and not at all like this strange concoction. Right?! Well, not quite. It’s paleo chocolate cake, so things will be a bit different. The strange concoction is then put into some cake pans, and into the oven it goes. 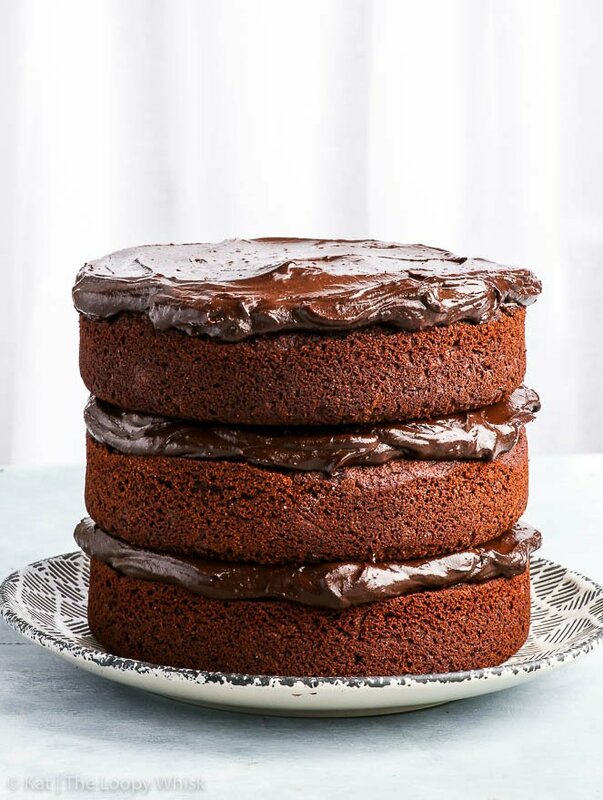 After anxiously sitting in front of the oven for about half an hour (no sense trying to deny it), we’ll allow the paleo chocolate cake sponges to cool and whip up a batch of the AMAZING paleo & vegan chocolate frosting. Another easy and healthy recipe that will leave you craving more. So. Good. And then… we’ll stack this beauty. There’ll be no fancy decorating here. I mean, you can go crazy and decorate to your heart’s content… but, honestly, we all just want to get to the eating stage. Yeah? Yeah. Sponge. Frosting. Sponge. Frosting. Sponge. An attempt to make the final layer of frosting look “pretty”. We’ll kinda succeed… but only kinda, because there’s an empty frosting bowl waiting to be licked clean… and, well, priorities. By now, people have probably noticed that there’s CHOCOLATE going on. Enjoy basking in the gratitude of people because you’ve made chocolate cake and that makes you the best kind of person. Also, when you inform everyone that that slice of decadent, moist, delicious chocolate cake they’re oohing and aahing over is actually healthy? It’s totally okay to feel a bit smug. To make things easier for you, here are the products I’ve used and recommend for this recipe! So often, I get asked about what kind of gluten free flour I use or which kind of baking pans are best – and I know that the baking/cooking world can be overwhelming, what with the bazillion different products available out there. Well, no more. Use a high quality coconut oil – organic virgin (cold pressed) coconut oil is often best, as it doesn’t have s strong coconut smell and aftertaste. Similarly, I like to use a non-GMO organic coconut flour and arrowroot flour. 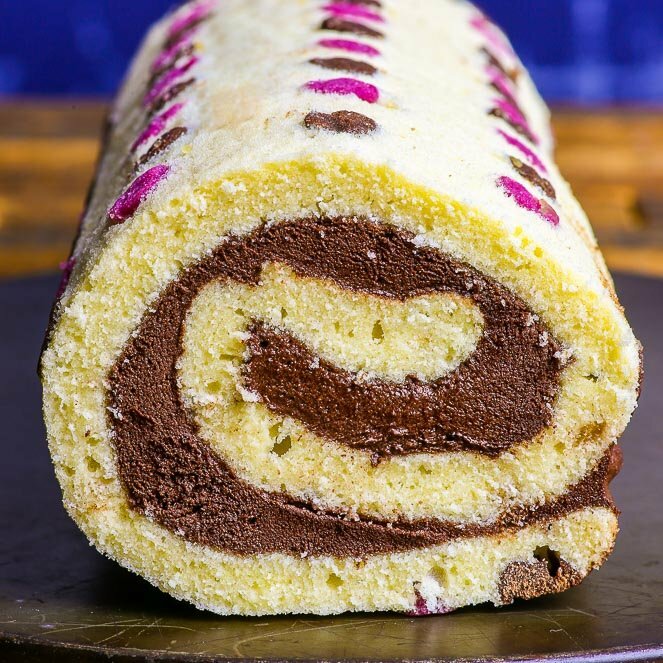 Note that this recipe makes three 6 inch sponges – so it’s a rather small cake, but that makes it super cute and perfect if you’re only baking for a small number of people… or even just for yourself! I love these 6 inch cake pans from Wilton. Pre-heat the oven to 355 ºF (180 ºC) and grease three ~6 inch round cake pans (at least 1 1/2 inch deep) with a bit of melted coconut oil. You can line the bottom of each baking tin with a bit of greaseproof/baking paper. (If you don't have three such baking tins, or they don't fit into your oven at the same time, make the cake batter in batches and bake them one/two at a time). 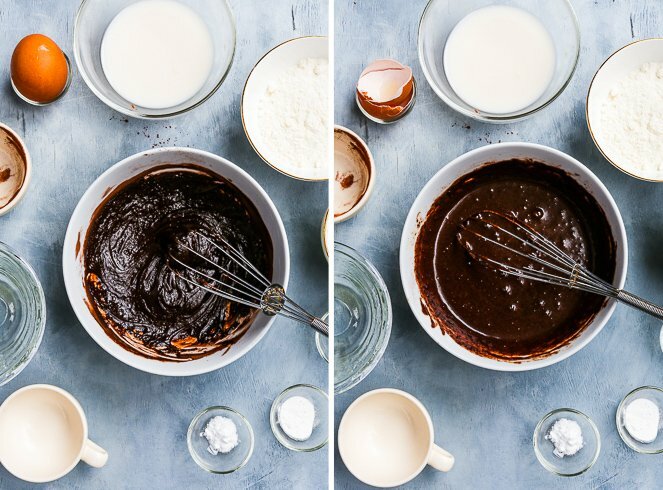 In a bowl, whisk together melted coconut oil, liquid sweetener of choice and cocoa powder until you get a mixture resembling thick melted chocolate. Add the eggs, one at a time, and mix well after each addition. Add the almond milk and whisk until you get a mixture that resembles hot chocolate. Divide the cake batter evenly between the three cake tins and smooth out the tops with a spoon or spatula. Bake in the pre-heated oven at 355 ºF (180 ºC) for about 25 minutes, or until the cakes have risen and an inserted toothpick comes out clean. Remove the baked cakes from the oven and allow to cool. 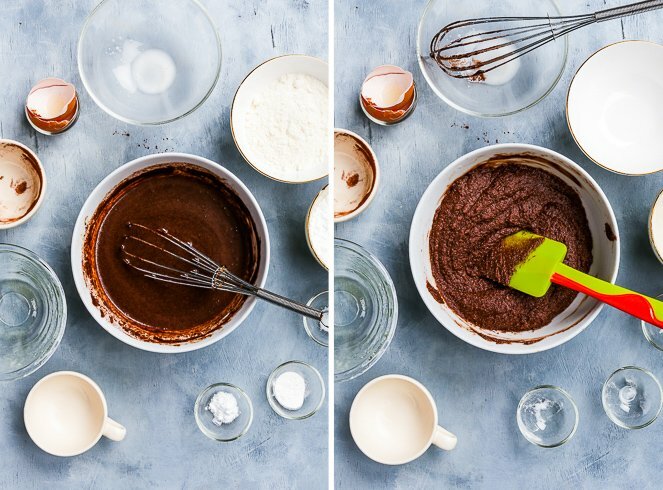 In the mean time, whip up a batch of the paleo & vegan chocolate frosting. Assemble the cake by placing the first sponge on a plate of choice. Spread out about 1/3 of the chocolate frosting on top in an even layer. Place the next sponge on top and repeat until you have used all the sponges and all of the frosting. The paleo chocolate cake keeps well in a closed container (or wrapped in cling film) in a cool, dry place for about 3 - 4 days. 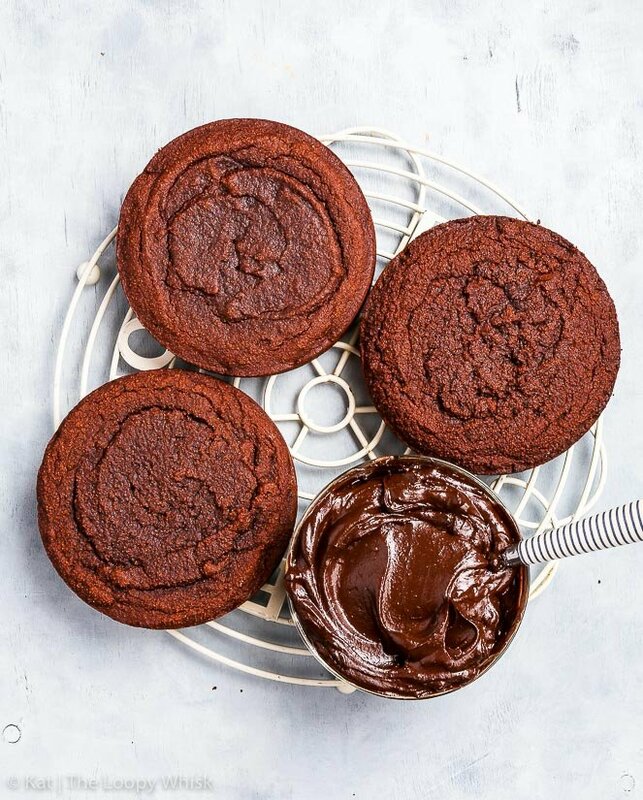 Note 1:Get the recipe for my paleo & vegan chocolate frosting here! 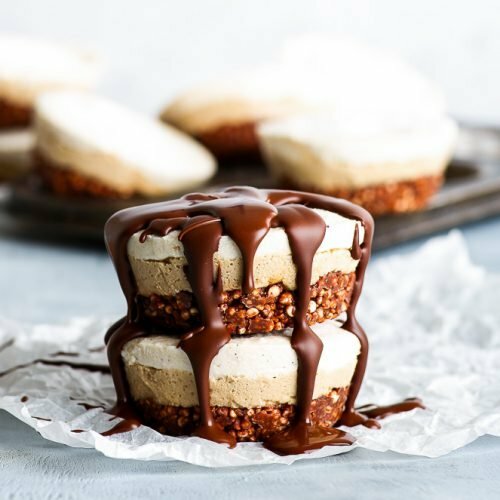 Looking for more delicious paleo desserts? I am wondering if I can make the same recipe replacing almond milk with regular milk and arrowroot powder with tapioca starch ? You might not be able to answer me, are you using arrowroot powder to bind? You can substitute milk with no problems, and I’m 99.99% certain that tapioca starch will work. Most of the binding comes from the eggs, so there shouldn’t be any problems. I would first try on a smaller quantity (for instance, make just one sponge cake rather than three) to be certain. Let me know how it goes! Wow, I am impressed. I found your recipe featured on thefeedfeed.glutenfree Instagram. 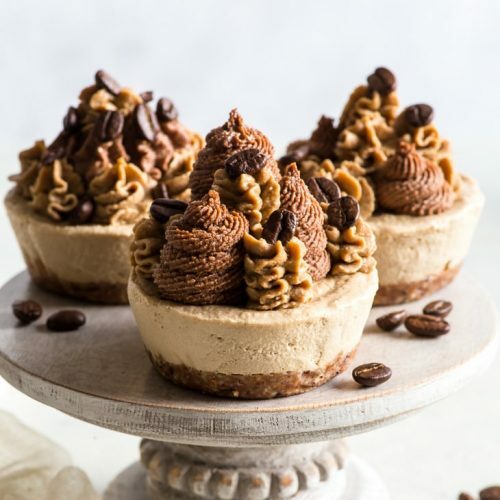 It looked delicious, but after reading the ingredients (in particular, coconut flour), I was afraid I’d be disappointed like all the other paleo recipes claiming to be “so good, even gluten eaters wouldn’t be able to tell the difference!”. Since I had some coconut flour I needed to use, and a craving for chocolate cake, I decided, “Oh what the hell, I’ll just give it a shot!”. I am so happy I did! I could not tell this was made with coconut flour (the cake had a nice texture!). I love that this is refined-sugar free and made with all natural and healthy ingredients, especially the avocado frosting! I did switch out the almond milk for whole organic cow milk. I am thinking of making this for a friend’s birthday who has a love for dark chocolate but has a hormone imbalance. Hi Sarai! Your comment totally made my day! I can’t express how incredibly glad I am you’ve liked the recipe. 😀 My aim was to develop a chocolate cake that is healthy… without tasting healthy, and I can see from your comment that it was indeed a success. Thank you for your kind words! Can I substitute the eggs for anything? Tried this for the first time tonight and seriously the best chocolate cake I’ve had. This will literally be the ONLY chocolate I will eat going forward. Absolutely fantastically delicious. Couldn’t find arrowroot flour so used corn starch instead (ordered arrowroot flower online immediately already because this awesomeness is happening over the weekend again) and still turned out amazing. Thank you SO MUCH for your kind words, you comment absolutely made my day! And just think about it – you could have this cake even for breakfast, it’s so healthy 😉 And who wouldn’t love THAT, right? When you sub corn starch for arrowroot, what was your ratio, 1:1 or less/more? I want to do this cake but don’t have coconut flour-and its expensive. Can I use other flours? I usually use almond, oats, rice. You think if I make a mixture like this with starch it could work??? Hi Hilla! I’ve never tried this recipe with almond or oat flour, but my feeling is it should work (although I can’t guarantee it with 100% certainty). If you do give it a try, let me know! Hands down, best coconut flour based choc cake texture and taste I’ve encountered (over 5 yrs) to date! I did try to lower the sugar content with applesauce and stevia replacing most the liquid honey content. Do not do that. Disappointment follows. Hi Michelle, I’m so incredibly happy you liked the cake! 😀 I haven’t experimented with artificial sweeteners and applesauce, but I’m hesitant to ever recommend the applesauce substitution when baking with grain-free “flours”… the results are usually not great. This cake recipe has gotten so many great reviews that I’d like to try it! I was wondering however, if I’d get the same results if I were to use coconut milk instead of almond milk? I see that coconut milk is listed as a substitute but would the flavour change much? My son has a severe nut allergy so I don’t keep, let alone bake with any nut products at home. 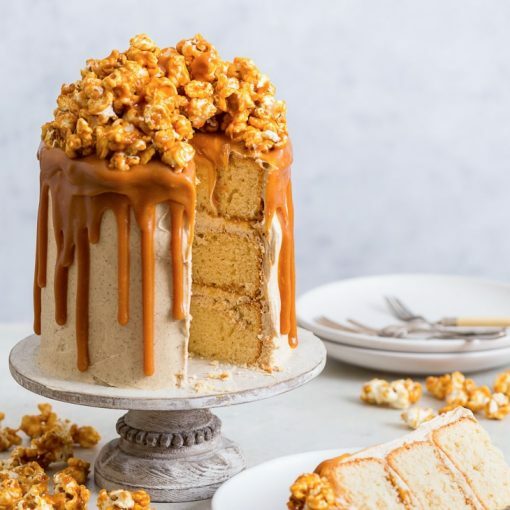 Could this cake be made in two 8” pans instead of 3 – 6” pans? Would you know how long they would need in the oven? Hi, I am gonna try to make this looks-so-amazing cake for my dad’s birthday which is coming close. When I checked this recipe, I realised that I don’t have arrowroot and I can’t find it near my home. Also I can’t order online due to shortage of time. Can you please tell me the PERFECT substitute for it? I made this cake for my assistant manager for her birthday. It turned out fantastic!!! Instead of having three six inch cakes, I made two eight inch cakes, baking it a little longer. I also added a bit more honey in the frosting to make it a little sweeter. Overall, the recipe for both the cake and frosting is so incredible!!! I have already shared it with two people! Good recipe, thank you! Though can we all acknowledge the measurements given are weird? I think most recipies would say something like 1/4c plus 1tbs. The cake looks yummy! Certainly plan to try this recipe right away! 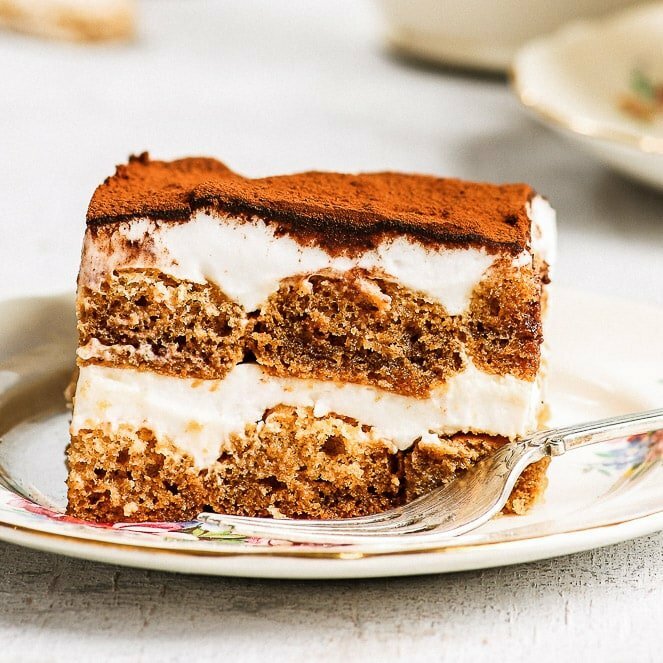 Can you please advise on the ingredient proportions for just one layer of this cake? Hi Amreet! Depending on what size and thickness of sponge cake you want, you’ll have to scale the recipe differently. I’ve used 6 inch round baking pans, so you’d use 1/3 of the recipe for just one 6 inch layer… but if you want to make an 8 inch layer, you’ll need more batter. Hi I can’t wait to make this! Do you know if this cake will keep well in the fridge or freezer as i want to make it in advance for a birthday later this week? Hi Brinda! So glad you like the recipe 🙂 I’m not sure how well the cake freezes, but it should definitely last a few days in the fridge. It might dry out slightly, so make sure to keep it in a closed/air-tight container! What an amazing cake recipe! 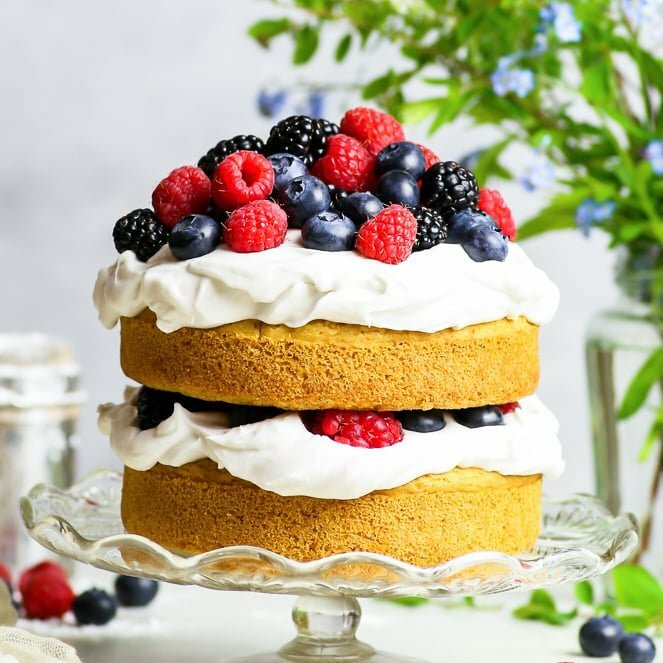 I was searching for a refined sugar free cake to make for my friend who cut out sugar a year ago, and was hoping to find something vaguely tasty as it was for her 40th birthday cake – well, she was absolutely blown away by how good this tasted! I’d happily give up refined-sugar to eat this 😀 Oh and the frosting was divine – literally eating it off the spoon!! Thank you for sharing this! Hi Brinda! I’m so very happy you both enjoyed the cake! 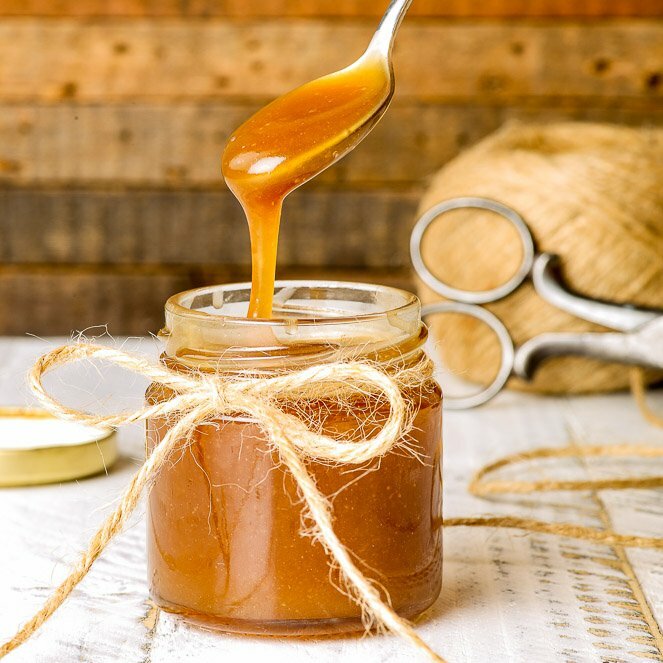 😀 Honestly, with the options to use maple syrup and/or honey… who needs refined sugar, eh? Do i need to use cold pressed or virgin coconut oil for this recipe? I used normal coconut oil and it had a very strong coconut oil smell. I am in India where coconut oil normally stays in liquid form due to temperature, and did not have to melt it. The batter was not thick in the end and was only enough to put in 2 6inch pans, cake rose well but then sank in the middle a bit. Hi Manu! Either should be fine, but definitely choose one that doesn’t have a very strong coconut flavour/smell. To a large degree, this depends on your preference, I know some people are very sensitive to the coconut oil taste and don’t really like it. The cake batter usually goes quite thick because of the coconut flour, it tends to quickly absorb a lot of moisture, but still gives a moist sponge. If you check the recipe, it’s meant to make two 6-inch pans, if you want to make a larger cake, just scale up the recipe. As for why the cake sank in the middle: that usually happens when the cake is underbaked. Before you take it out of the oven, always do the “toothpick test”: insert the toothpick into the middle of the cake, and if it comes out clean (maybe with a few crumbs) after about 2 seconds, the cake is baked. If the cakes didn’t rise, the first thing I would do is check whether your baking soda and baking powder are still active (within the expiry date). The cakes don’t rise significantly – they’re somewhere between a brownie and a sponge cake in texture, but they DO rise and shouldn’t be completely flat. I haven’t tried it in a big square tin, but it should work with no problems: I know other people have made this recipe on a larger scale with no problems. 🙂 As for getting the timing right, I always recommend you do the “toothpick test” to see if the cake is baked: insert a toothpick (or a skewer) in the cake, leave it for ~2 seconds and if it comes out clean (or with just a few crumbs attached), the cake is baked. It should also feel “spongy” if you touch/press the top with a finger. I’m so excited to try this recipe out. Quick question if I want to make 1 cake out of this recipe do I just hafe the measurements? Hi Emily! The recipe as written makes 3 sponge cake layers. If you want a single layer, divide the ingredient quantities by 3. Or, if you want one layer that’s thicker, just halve the recipe. Enjoy! OMG! My first attempt at Paleo baking and this recipe exceeded all expectations. I used cacao powder and divided the mixture into 12 muffin cases. Had trouble stopping myself eating all the frosting as soon as it was made. I can’t wait to try some of your other recipes. 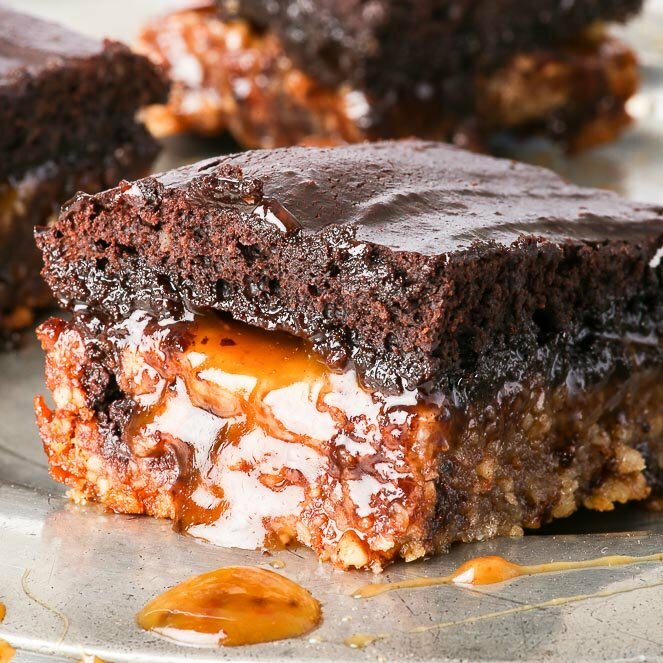 Would it work to use a larger pan and make a sheet cake with this recipe? Or two 9″ rounds instead of 3 6″? Hi Christine, I’m sure all the options would work with no problems, you will just need to adjust the baking times slightly. Use the “toothpick test” to check whether the cake is baked: insert a toothpick or skewer into the cake, and if it comes out clean after ~2 seconds, it’s baked perfectly! I tried this recipe and it tasted really good! Didn’t have avos so just made a chocolate ganache to go with it. I couldn’t find arrowroot so I replaced it with Cornflour (1.5x as per google searches), the cake came out quite crumbly. Wonder if it was excess cornflour? I was looking for a cake recipe to make for my next birthday. Finding such recipes has been hard, as I am paleo and dairy free. 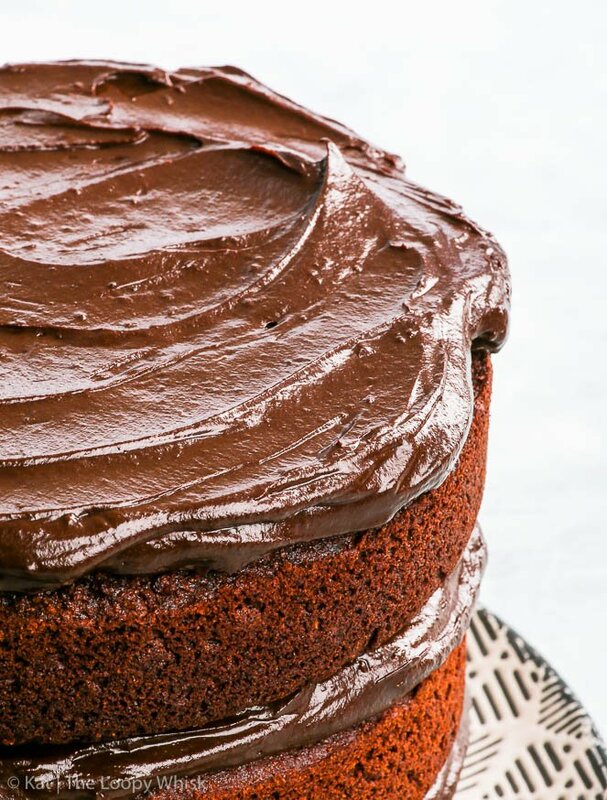 I also happen to love chocolate, but usually chocolate cake recipes require butter, so I was wondering “Is this going to work?” I scroll down, and I see the about me page, and I see that we share a name. It’s even spelled the same! I took it as a sign. I can’t wait for my birthday to come! I bet it tastes amazing! Well, I know we Kats are pretty amazing, but this is the first time somebody trusted a recipe of mine based on my name alone! 😀 But names aside, this cake is AMAZING and I’m sure you’ll love it! Hi Ana! You can use cornstarch or tapioca. Can’t wait to try this cake! I made 2 6 inch heart shaped trays. Wanted to post how beautiful it came it! But tasting the ganache/frosting (which tasted yummy!) and I can wait to try it foday/Valentine’s Day! My husband was impressed that I made this since I am not a baker what so ever! We’ll see how it tastes! I am very excited to try this recipe. In one of the comments you mentioned that the milk substitute needed to be the drinkable kind (vs. canned coconut milk) because the canned coconut milk would be too thick. I happen to have some “almond milk for cooking” on hand, but now am concerned it may have the same issue as the canned coconut milk. What do you think? The main problem with canned coconut milk is its high fat content which may result in a dense and/or oily cake. 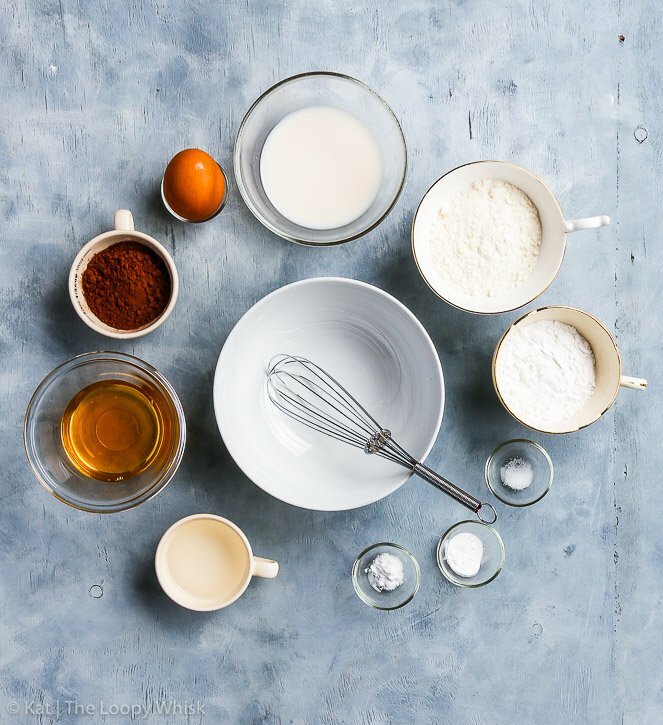 Almond milk should work perfectly – note that the cake batter will be fairly thick, but will bake beautifully. If I use maple syrup in the cake batter, is it better to use honey in the frosting? I wish I had gone with my instincts and added a 4th egg. Coconut flour needs lots of binding and the cake was too crumbly with just three. That being said – my 3 eggs were medium size, not large. Suggestion to Kat – specify the size of the eggs or add a 4th to the recipe. The only substitution I made was corn starch instead of arrowroot. For the measurements, I followed the weight (grams), not the volume (cups). The pudding-like frosting is great. I recommend using an immersion blender or a food processor, not a blender. I used a Vitamix blender and needed to add liquid (almond milk) in addition to scraping down the sides. Sorry you’ve had trouble with the recipe – I’ve actually used medium eggs myself without any problems at all. 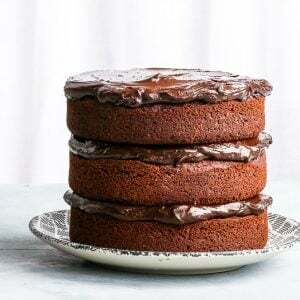 The 3 medium eggs, honey (or maple syrup) and non-dairy milk in the recipe should provide more than enough moisture to keep the cake nicely moist. What kind of sweetener did you use?